The encoder disk is flexible and it should be possible to slip it into the sensors without too much trouble. 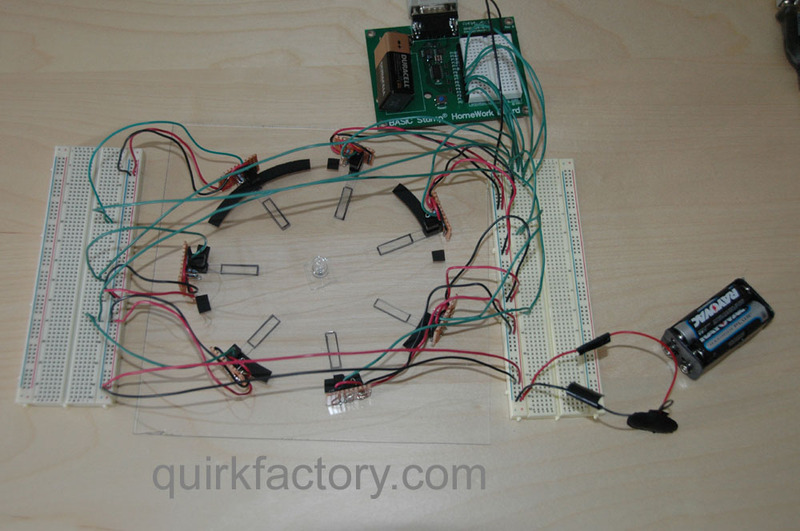 This photo shows a completed prototype, with the outputs hooked to a Basic Stamp. A simple thumbtack has been placed into the middle of the encoder disk, to act as a point of rotation. The single-track Gray code sequence omits numbers 0 and 127 in the 7-bit sequence, meaning the sequence has 126 numbers instead of 128. This BasicStamp program demonstrates an example of decoding the single-track disk.